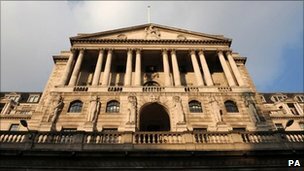 The Bank of England has agreed to extend its quantitative easing (QE) programme by £50bn to give a further boost to the UK economy. When completed, it will bring the total amount of QE stimulus to £325bn. The Bank started its QE programme, through which it buys mainly government-issued bonds from banks freeing up cash for lending, in 2009. The Bank’s Monetary Policy Committee (MPC) also said it would keep interest rates at their record low of 0.5%. UK interest rates have been held at that level since March 2009. The BBC’s economics editor, Stephanie Flanders, said the £275bn of QE undertaken so far was an amount equivalent to nearly 20% of the country’s gross domestic product. Inititally, experts were predicting an extra of £75bn of QE, but this figure was reduced to £50bn when economic surveys released last week indicated that the manufacturing and service sectors had performed better than expected in January. However, concerns remain over weak consumer spending and the eurozone crisis. The Bank said in a statement : “The underlying pace of recovery slowed during 2011, with activity falling slightly during the final quarter. It added that without another stimulus from QE, inflation was likely to fall from its current 4.2% to below its 2% target, as rising unemployment and falling import and energy prices fell away, and as the VAT increase from 17.5% to 20% last January also dropped from the annual comparison. Official economic data also released on Thursday showed import prices fell by 1.3% between November and December. Other figures showed that industrial production, which accounts for about 15% of the economy, grew by 0.5% on the month, against forecasts for a 0.2% rise. “Despite overall signs that activity picked up in January after GDP contracted 0.2% in the fourth quarter of 2011, the economy is far from out of the economic woods and it continues to face major obstacles to developing sustainable, decent growth,” said Howard Archer, chief UK economist at IHS Global Insight. It seems mind-boggling to most people that a tactic designed to get banks lending more would have the side-effect of knocking pensioners’ incomes. Quantative Easing (QE) makes annuities shrink. You get 25% less now than you did three years ago. The downward effect of QE on pensions happens because the annuity income you are promised tracks the interest rate the government pays on its debts. These interest rates are already low and QE pushes them even lower. By pressing the QE button, it could mean thousands have to make do with a whole retirement on less money. The new QE was greeted with dismay by the pensions industry. Joanne Segars, the chief executive of the National Association of Pension Funds, said while she could understand the need to boost the economy, QE was damaging the value of pensions: “Retirees who get locked into a weak annuity will find that the Bank’s money printing leaves them “out of pocket” for the rest of their lives. She called for help for pension funds from the Pensions Regulator.